I’ve just returned from an amazing, life changing trip to Kilgoris Kenya. The Kilgoris Project has been something that my church has supported over the past 2 years and some families in my church made it financially possible for me to take my first trip to Africa this January. I was excited about all the great things that I would see and the great things that TKP is doing, but God had some additional things in mind for me on this trip. So as I share stories about my journey – I thought I would start with the most significant one. My heart beats water. 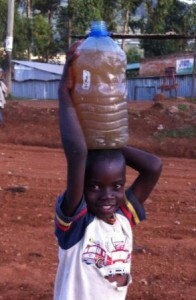 The moment I knew I was going to Kenya, I began to have some interesting conversations about water in Africa. Most people immediately think of drilling wells and finding areas that have no water and making it happen. An example of this has always been the work that CharityWater and LivingWater is doing around the world. I am thankful for these ministries – HOWEVER, I was interested in a concept that is far less popular… Protected Springs. The primary difference is a non-drilling approach of reconstructing existing springs and water supplies (where people already draw from) and making it safe to drink and sustainable for the long term (without pumps or electricity). My 2 experiences in Kenya fueled my heart beat for water. In the beginning of my week, I visited a spring that many people draw from. It was protected at one time, but the local doctor (Francis) member of TKP I was with told me that they didn’t construct it very well and it has turned back into just a puddle of water that folks draw from. I watched as a man drew bucket after bucket of filthy water from this puddle (natural spring) for his family. It was heartbreaking to see that this was the only option in the area (outside of rain water collection). Towards the end of my week, Francis took me to a protected spring that was working great, and had been working for many, many years to help me see what a protected spring looks like. It was AWESOME. I watched children playing, animals drinking from the animal collection area, and I saw a young lady draw clean water in a bucket to take home to her family. It is such an amazing contrast. Water that doesn’t satisfy, and clean water that gives life! My heart beats water… What does your heart beat?